A: Maybe for the western world brutalism is just aesthetics, but for eastern Europe, brutalism is an everyday reality. Everything around us, especially architecture is grey and super heavy. We are a new generation and we are proud of who we are. We try to find beauty in this environment and use it as our hallmark. Brutalism flashes in our veins are natural for us. Good thing is that from our perspective, brutalist styles are a leading direction in counter-culture circles at the moment. We (as CUKIER creative group) always wanted to stand in against to the marketing industry, which we see as artificial, over-hyped and super-hypocritical. We are still close to the streets, we are DJs, skateboarders, photographers, filmmakers, producers, we create the urban culture in Warsaw. 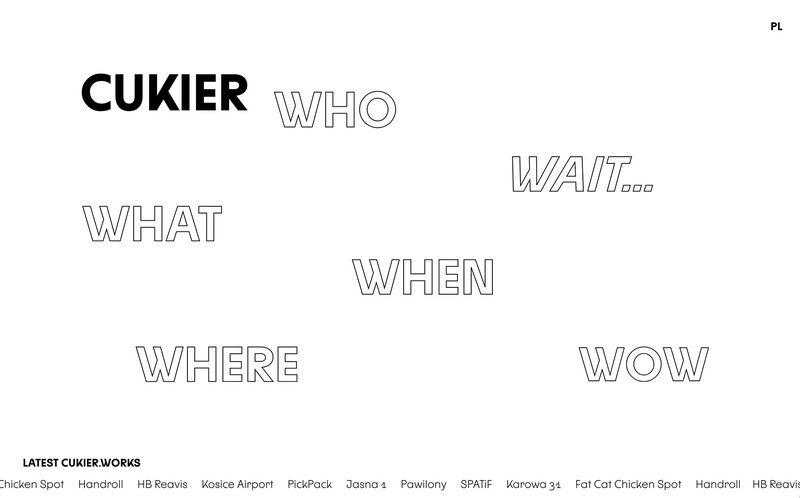 I think you must have a distance to yourself and your work to open advertising agency called CUKIER (eng. SUGAR) and make brutalist ID, website and do pitches for corporate clients. We are just different, we stand out from the crowd, we are true, we are the new wave - and surprisingly the market appreciates this authenticity. And 70% of our inspirations we took from brutalistwebsites.com, so part of success is yours.